and found it was a mistake, he had won it. I went over home to a meeting of the neighbors where I spent a couple of hours pleasantly. came home to do evening work. Friday March 18th 1898 It was a cloudy ugly day and began to rain before night. I was busy with house-work all forenoon and in the afternoon did sewing. The men were busy about the place, Levi plowed most of the day. Saturday March 19th 1898 Will took the things to town and was gone all day. I did baking and work about the house till after dinner. Fixed a dress some in the afternoon. Set three hens and was over to Emmas a few moments. Uncle George waked down here for a call. I knit in the evening. Sunday March 20th 1898 I was busy with the work most of the forenoon. I got up a nice dinner. I read all the afternoon and got out my old music and played in the evening. 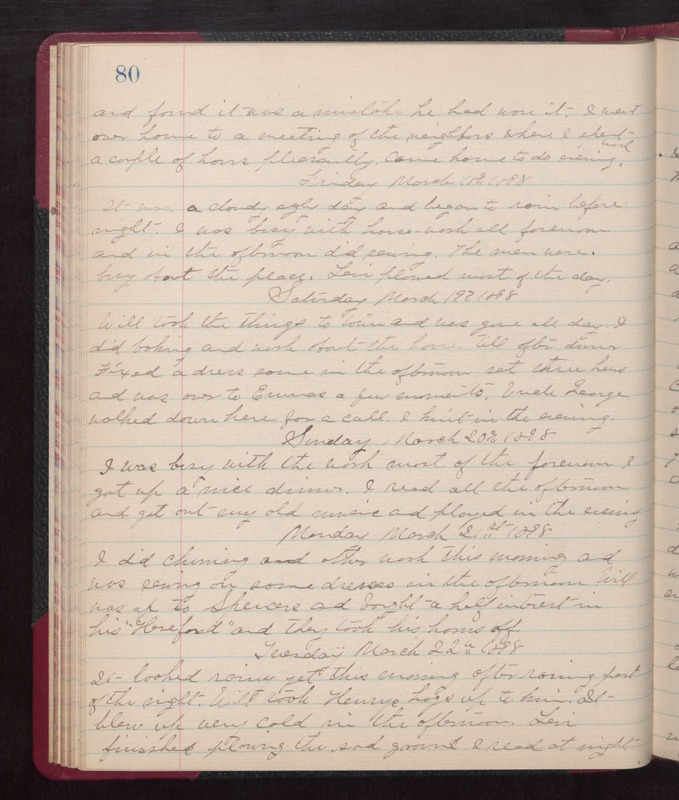 Monday March 21st 1898 I did churning and other work this morning and was sewing on some dressed in the afternoon. Will was up to Spencers and bought a half interest in his "Hereford" and they took his horns off. Tuesday March 22nd 1898 It looked rainy yet this morning after raining part of the night. Will took Henrys hogs up to him. It blew up very cold in the afternoon. Levi finished plowing the sod ground. I read at night.